There was just one fry up inspection in January at Zak's Waterside in Norwich, it wasn't particularly a memorable highlight though. The debate over whether you prefer beans served directly on the plate or separate in a ramekin however over on my facebook page was far more interesting. Opinions were divided with both sides insisting their preferred way was best. I'm personally not fussed either way really as long as they end up over my toast or fried bread. 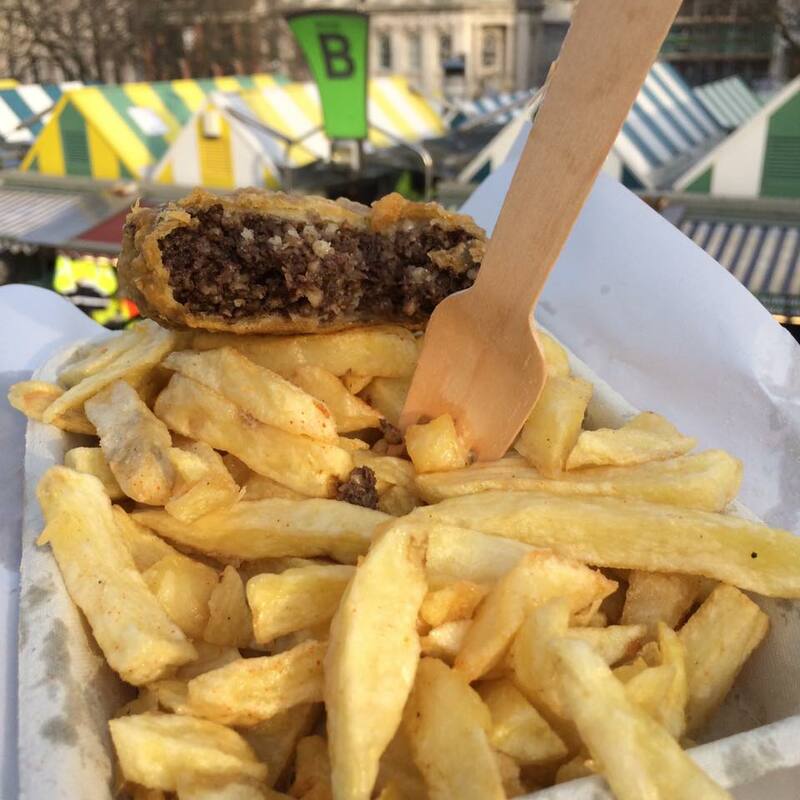 Towards the end of January I visited Norwich market where battered haggis was being served at Lucy's Chip Stall. I love haggis, so coated in batter and served with a portion of chips certainly made for a delicious lunch. 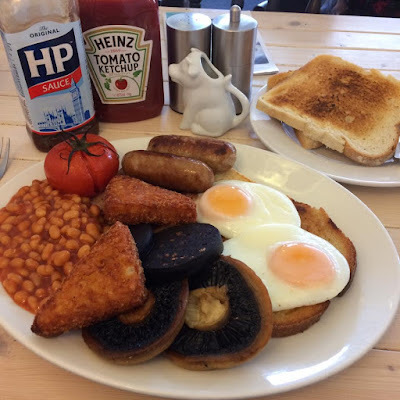 A trip to Acle in early February turned out to be a wise decision as I discovered the great breakfast being served at Scooters Cafe. 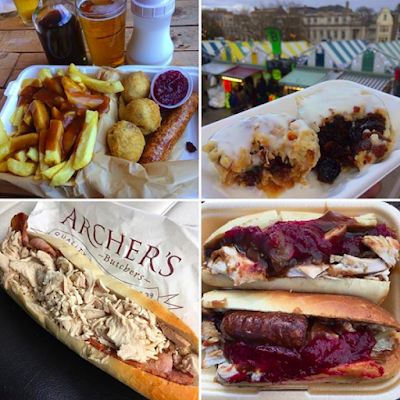 It featured sausages by Archers and bubble and squeak, both of which helped it to earn a place in the recommended section. The recommended section grew further towards the end of February when I went for a late breakfast at The Plasterers in Norwich. The beautifully presented big boy breakfast featured a pair of jumbo sausages from nearby Peter's butchers, great looking eggs and a mug of coffee in a Charles and Di mug. Jan's Country Kitchen had told me to visit them a long time ago and by the time I finally made it out to Mulbarton I was just in time as a few weeks later it sadly closed. Most definitely a highlight though as Jan was cooking up The Works breakfast which included a drink for a mere £6. Bear in mind though that this breakfast featured quality butchers meats and was cooked in a catering trailer outside the wooden cafe building, impressive stuff and incredible value for money! In April I visited Stars Cafe and Drayton Road Cafe in Norwich, I also headed to London to check out Barbarella's Cafe and cycled to Reepham for breakfast at Diane's Cafe. All nice enough but my April Highlight had to be breakfast at Olives, the perfect start to my Easter weekend. Back in March Pandora's Kitchen suddenly closed it's doors for the last time, later in the month 67 London Street re-opened in it's place. It was in May when I finally went along to check out The Whole Shebang breakfast and it was amazing! Sadly by the end of the year it had closed it's doors for the final time. I'm proud to have The Street Cafe in Norwich as my local cafe and this bumper breakfast I ate there in June was just what I needed when I woke up craving a really nice fry up. The service, environment and food is consistently excellent every time and they serve the best ever sausages by Archers. 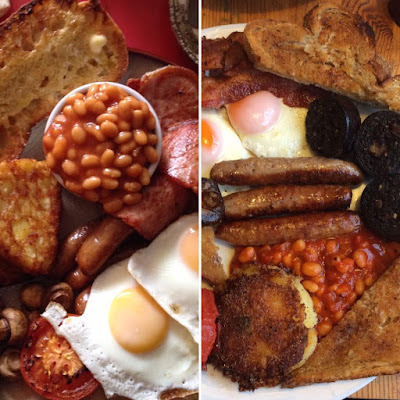 In June I'd also visited Brewdog in Norwich and Rosy Lee's Tea Room in Loddon, but the mighty Street Cafe breakfast really stood out and was most definitely my highlight of June. Having not been abroad for a whole year I was eager to head to Spain in July for the 2017 Spanish Food Adventure. My wife and I ate our way through Girona, Barcelona and Seville, stopping off at The Psychobilly Meeting Festival in Pineda De Mar as well. In August I made the most of the hot weather and enjoyed eating out on the streets of Norwich. The choice of food stalls on Norwich Market was growing and some pretty impressive things were being served up. 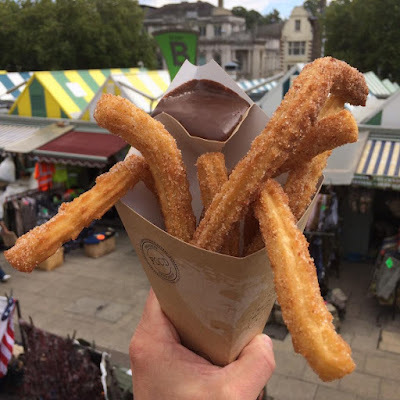 One thing that I particularly enjoyed was the delicious churros being served at Churros and Chorizo, even better than the ones I'd eaten last month in Spain! I also checked out Red Herring at Grosvenor Fish Bar in Norwich. 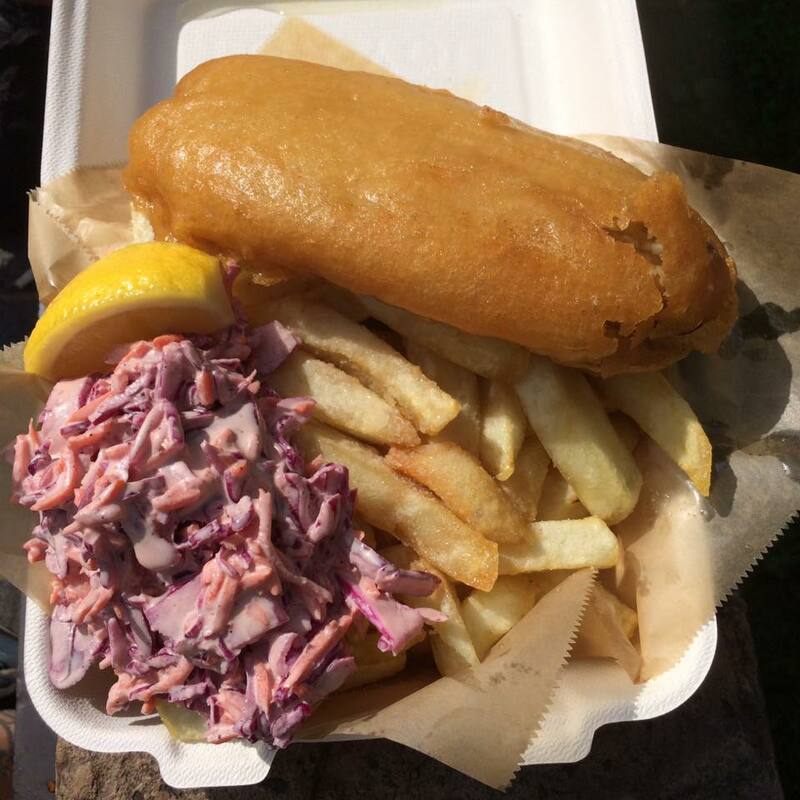 Crispy battered smoked herring served with a red coleslaw and chips, a thoroughly delicious combination that went together so well. Certainly an unforgettable lunch which I enjoyed on the wall outside The Birdcage. 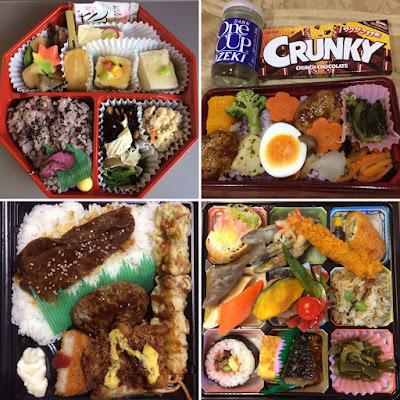 Without a doubt my highlight of the year began in September when I returned to Japan once again for The Japanese Food Adventure - Chapter 3. 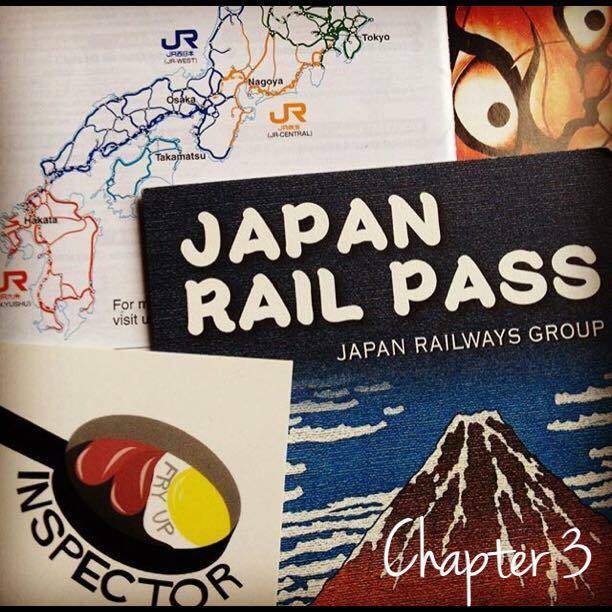 We travelled over 5000km by bullet train from Sapporo in the North right down to Kagoshima down South. We also visited Tokyo, Hakodate, Sendai, Takamatsu, Naoshima and Nagoya. Not only a highlight of 2017 but I'd say the highlight of my life, I loved this trip! I spent the beginning of October in Japan and the rest of the month writing about it, you can read all about it here. 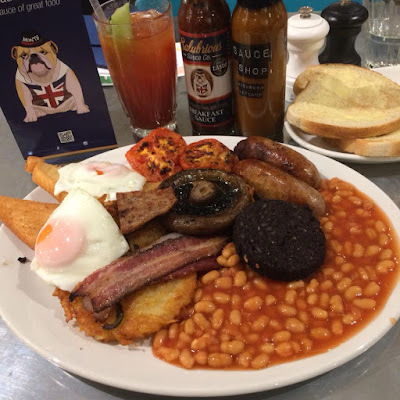 The fry up event of 2017 was without a doubt National Fry Up Day on 4th November and the place to be was at Pomonas in London at The Great British Fry Off event organized by The Fry Up Police. I nervously went along on my own and came away hours later (I nearly missed my train!) having had a great time. I met some fantastic people there, got quite drunk and enjoyed an incredible fry up made by top London chef Gareth Sanderson, the Pomona team, Ben Hesketh and the legendary Doctor Fry. 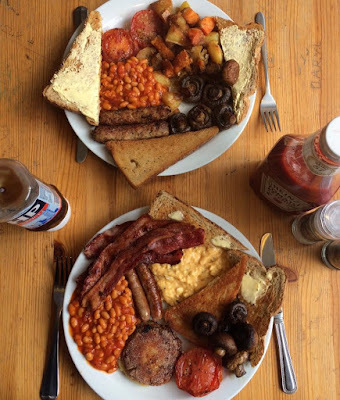 The fry up featured ingredients by Archers, The Fruit Pig Company, Palfrey & Hall and Cackle Bean. The sauces to accompany it were by Salubrious Sauce Co, Sauce Shop and Howling At The Moon. I can't wait for next years event! As December was edging closer and shops had their Christmas displays all set up I got excited about festive sandwiches once again. I tried many of the chains offerings and Pret once again impressed me but many of the others were a bit bland and lacked flavour. 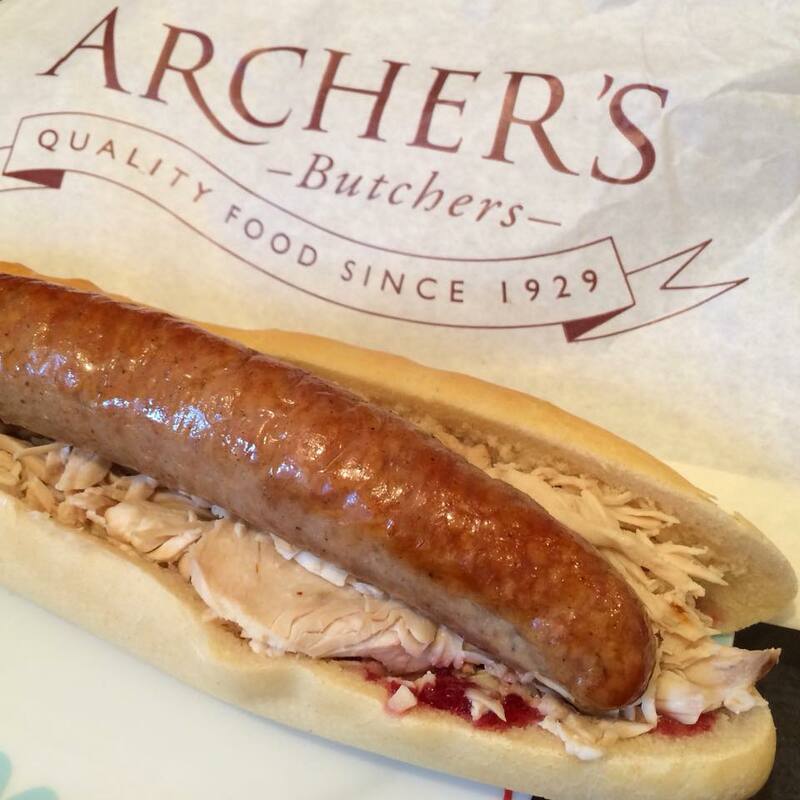 I knew Archers wouldn't let me down though, their festive baguette proved that independents are always the best option. 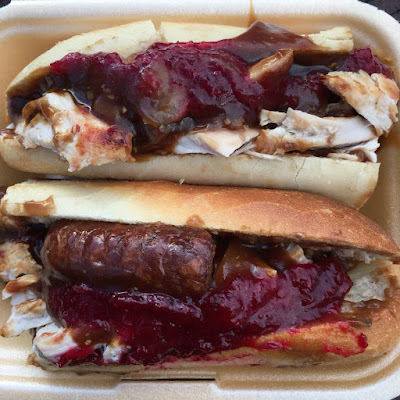 I also learnt that they serve their turkey, stuffing and cranberry sauce baguette all year round, I celebrated by adding a sausage on top. 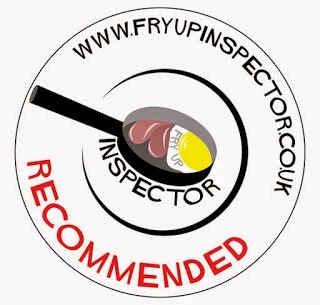 My wife had nearly always accompanied me on fry up inspections since I started my blog over seven years ago. As the blog progressed she became vegetarian and then vegan, this gave me an insight into the veggie/vegan options available at each place I visit. 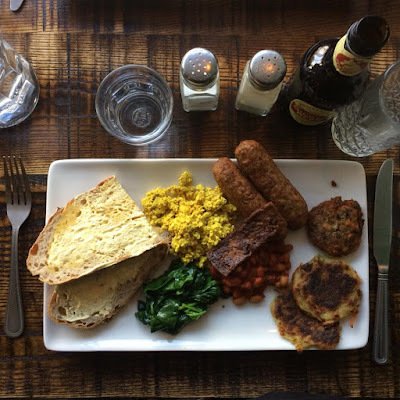 In November I gave her access to the blog so she could write her first review which was brunch at The Tipsy Vegan in Norwich. She did an excellent job and I do hope she writes more reviews in the future! In December I went in search of the best festive take away food Norwich had to offer. As always my top finds were available from Norwich Independents, you can read my Four festive favourites in a fine city article here. Many thanks for your support in 2017! Not only is Norwich home to some incredible Full English breakfasts, it also offers some pretty impressive Christmas food to keep you going whilst Christmas shopping. 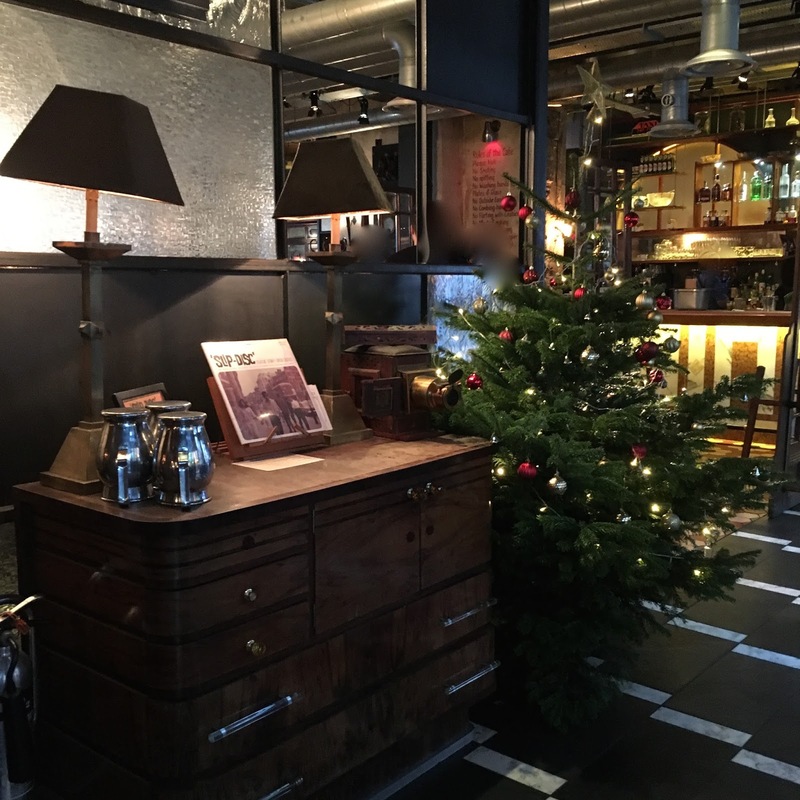 The best place to find them as always is at the local independent businesses, here's my four festive favourites to be found in our fine city. If you head along to Grosvenor Fish Bar on Lower Goat Lane you can enjoy this Christmas dinner for £6. They've created something special by combining elements of Christmas dinner into a delicious chip shop lunch. 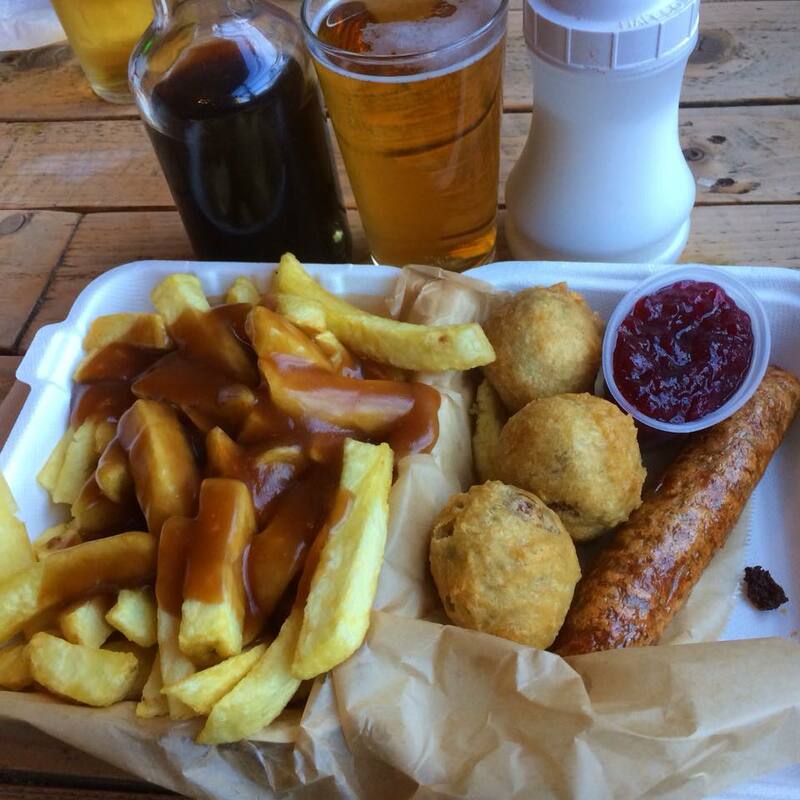 It consists of a turkey butchers sausage, battered stuffing balls, chips, gravy and cranberry sauce. You may want to sit down in the warm to enjoy this but that's not a problem, there's seating available inside or if you prefer it can be delivered to The Birdcage across the road where you can enjoy it with a drink. You can enjoy this until Christmas from 11.00am till 7.00pm, they are closed on Sunday though. 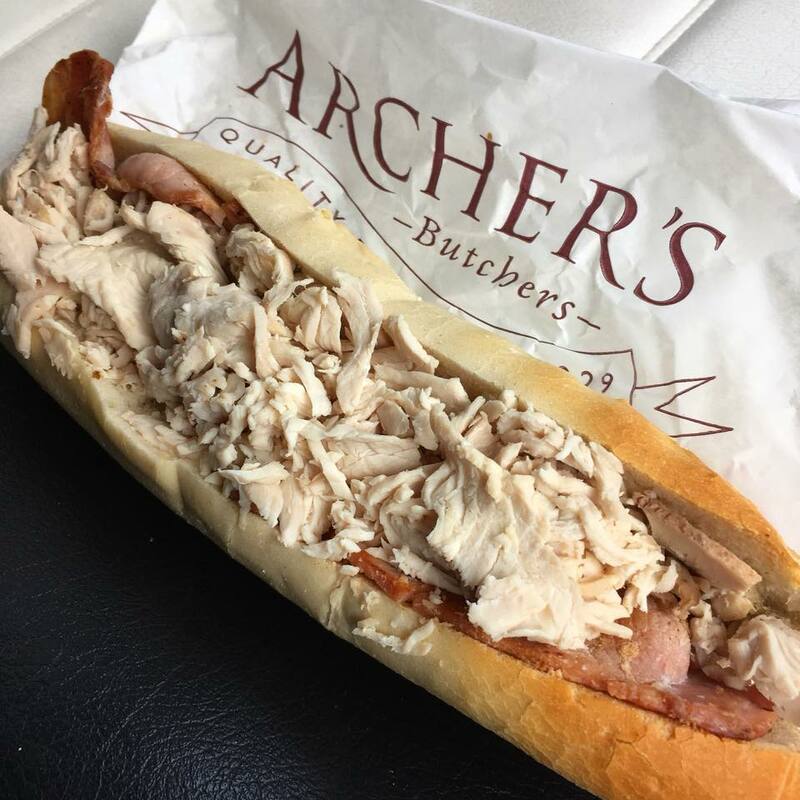 North of the city on Plumsted Road is where you can find the multi award winning Archer's Butchers. It's well worth stopping by there to pick up a baguette from their hot deli counter, it serves from 8.00am till 2.30pm Tuesday to Saturday. This delicious festive baguette contains Turkey, bacon, stuffing and cranberry sauce. It costs £3.50 for a small baguette or £4.65 for a large one, best of all it's available all year round! Whilst your there be sure to check out their sausages, you really can't beat an Archers sausage and it can be added to the baguettes too. If you're looking for a festive baguette fix in the city centre then keep walking past Subway and make your way to Urban Munch on Castle Meadow. Their festive baguette costs £5.95 and is crammed full of turkey, stuffing, sausages, onions, gravy and cranberry sauce. They're also offering Christmas roasts to take away too from Monday to Saturday, 8.00am till 3.00pm. 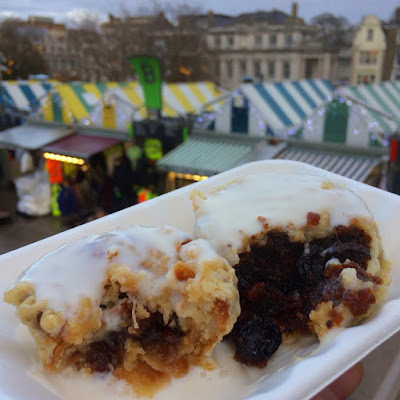 If you're feeling festive but have a sweet tooth then you should visit Lucy's Chip Stall on Norwich Market. Until Christmas they're offering battered mince pies for 60p and battered Christmas puddings for £1.20. Both are really delicious, served with brandy sauce and excellent value for money. Don't wonder which one to choose though just order them both! The stall is serving these from 10.00am till 4.00pm Monday to Saturday and from 11.00am till 3.00pm on Sunday. You may well spot Dishoom on Shoreditch High Street but the entrance is found on Boundary Street which runs parallel. We were mindful that Dishoom is very popular and can get very busy so we booked a table online in advance. Admire the Christmas tree whilst waiting to be seated. It was almost empty when we arrived but by the time we left it was packed. Indian photos adorn the walls. The bacon naan roll was highly recommended but I wanted to taste more things so ordered The Big Bombay with a big price tag of £11.50. Through researching online my wife had discovered they also offer a vegan breakfast menu. This was a really nice gesture! Cutlery is already on the table and water is served once you're seated. A cappuccino here cost £2.70, a vegan version is available too which pleased my wife. When the food arrived we were delighted at first glance, the food was nicely presented on beautiful plates and the portions seemed quite generous. This is the Big Bombay breakfast which cost a whopping £11.50. A full English breakfast with an Indian inspired twist. The streaky bacon was from Ginger Pig but I wasn't particularly impressed, I'd tasted far better streaky bacon at Olives in Norwich. The peppery Shropshire pork sausages were looking very pale on one side, more time needed in the pan was my initial thought. They were browned the other side though and were most certainly a stunning tasting sausage. I didn't understand why a pair of bread rolls is served on this breakfast at all, I felt like I'd been invited to a friend's BBQ. The Masala beans tasted like normal beans to me, I only noticed they were Masala beans whilst writing this. The tomato tasted of nothing at all so I covered it in this tiny portion of ketchup to achieve a tomato taste. My wife's vegan breakfast lacked imagination but was far more reasonably priced at £6.50. Veggie/vegan option - There's a couple of veggie options on the main breakfast menu and a vegan Bombay can be found on the vegan menu. My wife ordered the vegan Bombay which cost a far more reasonable £6.50 and contained mushrooms, masala beans, tomato, toast, avocado and mint chutney. My wife thought it was a reasonable price but lacked imagination.